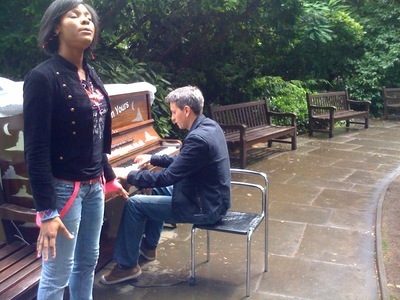 I played the piano at St Paul's Cathedral churchyard last Sunday. A little bird came to listen. Vacationing in London June 24th, took a break in the garden at St. Paul's, the most lovely surprise to hear passersby play the piano. A perfect day! Amanda and I played here for quite a bit :) Nice piano but had lost a few keys!! !